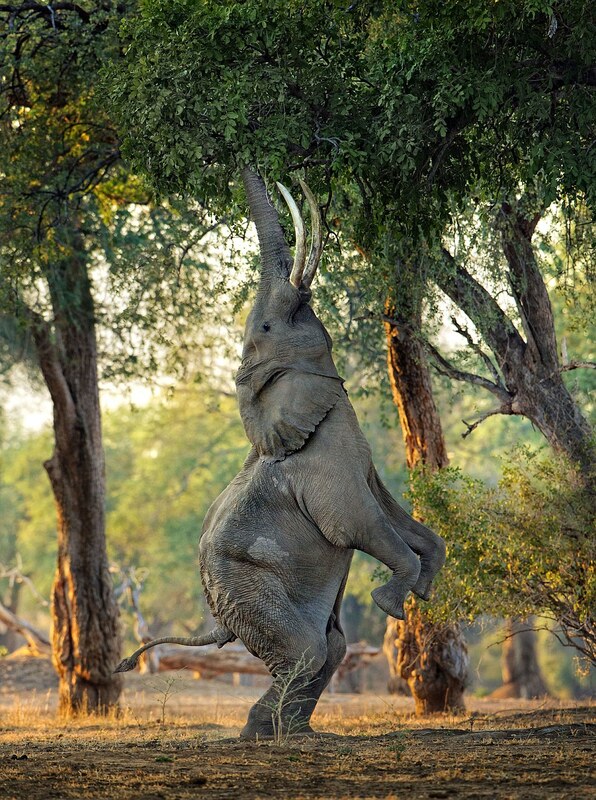 Some acrobatic elephants there, I think! Deep in the heart of Mana Pools National Park, in the shade of a mighty winter thorn tree, an old bull elephant is flapping his ears to keep himself cool. It’s almost spring in the Zambezi Valley and at last the seed pods, an irresistible delicacy for elephants, are ready to eat. Most elephants wait for baboons to shake down the ripe fruits and then scoop them up from the ground; but not this bull. Almost uniquely, over the years he has learnt how to stand on his hind legs like a circus elephant to pluck the most succulent pods with his outstretched trunk.In doing so, he has made himself a YouTube star. 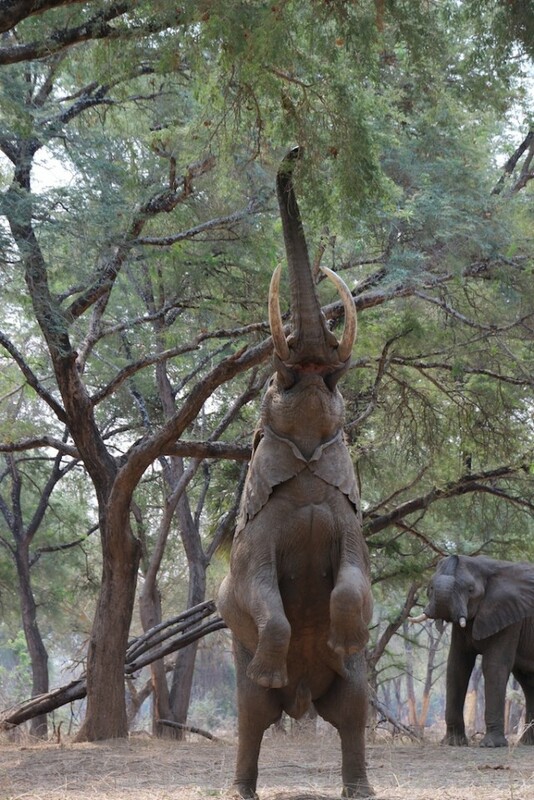 Meet Boswell – the most famous elephant in Zimbabwe. Mana Pools is a land of giants, of colossal trees and huge elephants that live by the banks of the mighty Zambezi. It is home to two legendary veterans: Boswell, named after a famous SA circus because of his unique feeding habits, is one; the other is John Stevens, Zimbabwe’s most respected safari guide. Both have been wandering around Mana Pools for close on half a century. Ask anyone for a list of Africa’s finest safari guides and John Stevens’s name will come out near the top. Now aged 70, he has lost none of his boyish enthusiasm for nature. “I love this place,” he declares. As you might expect from such a safari aficionado, John’s Camp is a genuine canvas bush-camp, stripped of all trivia but unsparing when it comes to the essential luxuries: comfortable beds, hot bucket showers and dining under the stars. After dinner, sitting around the campfire while hippos honk out on the floodplains, he describes how the park used to be before the poachers moved in and finished off the black rhinos. Now Stevens is determined they shall not follow the rhino into oblivion. That is why with Nicci, his wife, he helped to establish the Zambezi Elephant Fund in 2015. Stevens and his fellow guides need elephants such as Boswell to attract the tourists upon which their livelihoods depend, while big tuskers like Boswell need the Zambezi Elephant Fund to protect them from poachers who have wiped out more than half of all elephants in the valley since 2001. When Boswell was born, Stevens was working for Zimbabwe’s national parks department as the warden of Mana Pools, leading anti-poaching patrols, building access roads and developing its tourist infrastructure. About that time he remembers seeing a magnificent bull elephant with huge tusks that must have weighed about 45kg each, and wonders if this was Boswell’s father. In 1981, Stevens left the parks department to build Chikwenya Safari Camp at the north-eastern end of Mana Pools, and four years later he struck out on his own to become one of Zimbabwe’s first private safari guides. For Stevens the 90s were the heyday of his guiding career in Mana Pools, leading his guests on canoe trips down the Zambezi and tracking the last of the black rhinos in the jesse bush – a colloquial name for the dense blanket of bone-dry scrub that covers the park’s trackless hinterland. Boswell, meanwhile, was now entering his prime; a magnificent tusker whose appearance was in no way diminished by the loss of half his tail – perhaps bitten off by a crocodile. But in 2002, following years of political instability under President Robert Mugabe, Zimbabwe’s tourism industry crashed. One or two operators refused to budge from Mana Pools, including Andrew “Stretch” Ferreira, whose presence deterred the poachers and helped save the lives of some of the park’s bulls such as Boswell; but business was so bad that Stevens decided to move his safari operation to East Africa. During this time, many elephants related to Boswell were probably shot for their ivory, and Boswell himself would have been a prime target; but miraculously, when Stevens returned, the big tusker was still there. Just as Boswell can be recognised by his stumpy tail and unique feeding habits, Stevens is recognisable by his broad-brimmed hunter’s hat. “It’s actually Australian,” he says, “an Akubra my daughter bought for me”. Now, impeccably turned out in his neatly ironed shorts and bush shirt, he leads me into the park that is his spiritual home. Mana Pools became a Unesco World Heritage site in 1988, and the Zambezi, the fourth longest river in Africa, runs along its northern border, forming a natural barrier between Zimbabwe and Zambia. Mana means “four” in the Shona language and refers to a quartet of oxbow lagoons; but the park’s greatest glories are the woodlands that grow at the edge of the floodplains. All around us the tall trees reach for the light. Arching overhead like the tracery of a cathedral, their branches create aisles of dappled shade in which herds of impala flit away at our approach, and this is where we spend most of our time searching for Boswell. Having turned up at the beginning of the week he has since disappeared, and the word is he is now in must, pumped up with testosterone and looking for a mate in the jesse. This is where the elephants like to hang out until the heat builds up and there is a general movement towards the woodlands. First come the breeding herds of cows and calves and then the solitary bulls, all lured by the promise of water and a feast of those sought-after seed pods. But there is more to Mana Pools than Boswell, as I discover when Stevens takes me down to the Cheruwe river, on whose banks a seven-strong pack of endangered wild dogs have made their den. In a little while we hear a gruff bark followed by the excited twittering of the pups as the dogs return, regurgitating the remains of an impala they killed on their morning hunt. Back in camp, I awake in the small hours to hear the Nyamatusi lion pride roaring in the starlight, and in the morning, after a quick coffee and porridge, we go to look for them. But the cats are long gone, so we pick up their tracks again the next day and follow them across an open plain of grass. For more than an hour we pursue them, walking slowly through the spiky thickets with Stevens providing a master class in the art of tracking. It’s obvious we are hot on their heels when he points out a tuft of dry grass that has been flattened under their feet – and is now slowly rising. When we reach the near-impenetrable jesse bush, he holds up his hand. “Don’t think we’ll push them any further,” he says. Afterwards, tucking into a picnic lunch and a long, cold drink, I’m still mentally re-playing the experience of tracking big cats with this extraordinary man, and I think to myself: if anyone can save Boswell and his kind from the poachers it is surely Stevens and the Zambezi Elephant Fund. Brian Jackman’s visit to Mana Pools was arranged by Steppes Travel (steppestravel.com), which offers an eight-day itinerary to Zimbabwe from £3,995 (R74,141) a person based on two people sharing, staying at John’s Camp in Mana Pools and Victoria Falls and including international flights with Ethiopian Airlines (ethiopianairlines.com), internal flights and transfers.